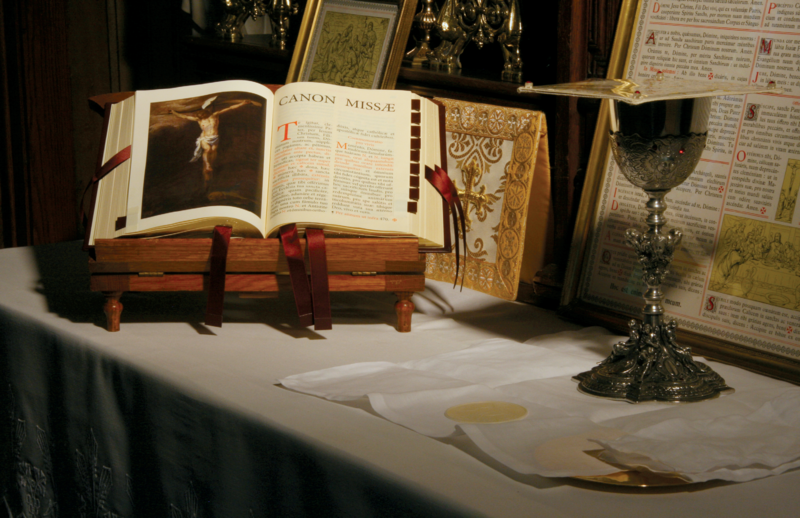 On April 3, 1969, Holy Thursday, Pope Paul VI issued the apostolic constitution “Missale Romanum,“ on the new Roman Missal. Use of the new English translation of the Mass began on the First Sunday of Advent, Nov. 30, 1969. Just over one year after the pope’s announcement, G. B. Harrison, a leading Shakespearean scholar who participated in the work of translation, reflected in the May 9, 1970, issue of America on the process of rendering the Latin into English. This article has been republished as part of America’s special 110th anniversary issue. The Second Vatican Council first came together in Rome in October, 1962, and one of its first accomplishments was to approve a Constitution on the Sacred Liturgy and its reforms. This document was promulgated in December, 1963. Few read it; fewer heed it. The purpose of the reforms was to encourage the people to take an active part in the rites of the Church. To this end the old rigid uniformity was relaxed. Each Episcopal Conference can adapt the liturgy to the special gifts of the people, provided that the substantial unity of the Roman rite is preserved. The vernacular language may be used, but no person, be it noted, not even a priest, may add, remove or change anything in the liturgy on his own responsibility. It was not the intention of the Council that Latin should disappear from the liturgy; far from it. The people, it was urged, should be trained to sing or say in Latin those parts of the Ordinary that pertain to them. In 1963, the concession that some parts might be in the vernacular was quite new. Less than five years earlier, in the new edition of Jungmann’s famous study of the Roman Mass, he wrote that changes could not be expected for many years, and as for the vernacular in the Mass, that would hardly be worth hoping for. Only five years. Few in the Council had realized that when you open the gates to a large and impatient crowd, they rush in and are no longer controllable. Once the vernacular was admitted, the demand for its full use was general and quite irresistible. ICEL first met in Rome in November, 1965. It took some time to settle down together, and there were great differences of opinion about the proper styles to be aimed at. More than a whole day was spent on whether “thou” or “you” should be used in the liturgy. In the end the vote was 7 to 1 for “you” but the difference inside and out was so fierce that deadlock could only be avoided when we compromised reluctantly that all texts should be in both forms. That decision seems to be passing into oblivion. More than a whole day was spent on whether “thou” or “you” should be used in the liturgy. From this meeting, however, emerged our first publication—a pamphlet called English for the Mass. It set out different ways of translating such texts as the Gloria, the Credo and the Agnus Dei. And it asked for criticism and advice; we got it. Some 16,000 copies of the pamphlet were sent out; more than 4,000 replies came back, which revealed a great conflict of opinions strongly held and often violently expressed. Some wished the committee to rewrite the Mass. Others demanded that we keep as close as could be to the language of Cranmer’s Book of Common Prayer and all the ancient forms of liturgical language. Others again were as eager for the disappearance of the old familiar words, even “almighty,“ “everlasting“ and “amen.“ We were urged to follow the vocabulary of the Beatles as that of the generation to come. A second pamphlet was issued a year later: English for the Mass, Part 2. This was a large collection of translations of the prayers, prefaces, prayer endings and the like. In the introduction, we pointed out that it was not our task to remake the liturgy but to translate what might be provided by Rome, and we replied to those who demanded that we use the contemporary idiom that there is no such thing, for contemporary idiom changes from place to place; the idiom that is modern and contemporary to a liturgiologist in Chicago is very different from the idiom natural to a taxi driver in London. The final translation, we claimed, cannot be in any particular idiom— “it must aim at good, straight, simple English which brings understanding to the unlearned and delight to the literate.” English for the Mass, Part 2 produced very few answers and no offers from those with the gift of writing good, straight, simple English. The original intention of the Council Fathers was that only certain parts of the Mass should be translated into the vernacular, and for some months—it seems so long ago, but it is less than three years—the Mass was part English, part Latin. Pending official translations, different dioceses used what was available in existing missals for the Gloria, the Creed and other parts, but the offertory prayers and the Canon were still being said inaudibly in Latin. This hybrid was generally felt to be most unsatisfactory, and in the early Spring of 1967, the American bishops petitioned that the Canon might be said aloud in English. To their surprise, permission from Rome was given three weeks later; haste is not usual in such matters. The result was that ICEL was ordered to have the translation ready for use in the fall. The idiom that is modern and contemporary to a liturgiologist in Chicago is very different from the idiom natural to a taxi driver in London. Fortunately, the Advisory Committee was not entirely caught by surprise. For several months individual translators—including some who were most insistent that new styles should be used—had been trying out English versions of the Canon. And again most fortunately, the demand for the translation of the Canon was made just before ICEL met in Washington at the end of May. Three members of the Advisory Committee were detached to consider the translations and to prepare a version for the approval of the Episcopal Committee. One of the translations offered was by a group of modernizers in this country. It was incredibly drab, but it stirred the three translators to get away from the usual kind of “sacral” style. The result was the first breakthrough, something new in English liturgical language. The Canon in English was published in October, 1967. It was greeted with startled screams by the conservatives. Long before it was ever heard in use, the London Tablet damned it in a harsh review and a harsher editorial, and for several weeks printed letters from priests and laity. After a few Sundays the tone altered. And one of my former graduate students wrote to me that he thought the new translation was commonplace—until he heard it, and then to his surprise, it became a thing of simple moving dignity. These words are his, not mine. The Advisory Committee thus learned early that its work could not be carried on in any kind of cloistered serenity. Whenever a Latin text is published in Rome, there is immediate clamor for a translation. The practical difficulties are considerable. One of these is distance. Since ICEL is a truly international committee, translations and proposals must be considered by each member before they can be approved; and even with air mail, it takes three weeks for answers to be received. Moreover, the committee as a body cannot be assembled from all parts of the world more often than twice a year. We try therefore to anticipate demands. The Canon in English was published in October, 1967. It was greeted with startled screams by the conservatives. In planning ahead, the officials of the Consilium in Rome are not too helpful. They are aloof, and even in Rome we never meet them. Latin texts are secretly prepared by expert committees, and usually they are altered and revised several times before the final official text is approved and published. There were at least five texts of the Order of the Mass, all differing quite considerably before the promulgation in April, 1969. Such tight security is (in theory) preserved that the ICEL was not allowed to see even an advance copy before it was published. By this time the Advisory Committee has developed a procedure for translating. For example, before the final version of the new Order of the Mass was published, it went through several stages. From the first we have experimented with such texts as the Gloria. After the 4,000 comments had been received in 1966, an editor was appointed to study some 200 of the best and come up with a draft text for the Advisory Committee to scrutinize when it met in Rome in the Fall of 1967. At this meeting a text was evolved which was then sent around to a large body of consultors. They commented at length. Meanwhile the Latin text had been so drastically revised that most of the comments had ceased to be relevant. So the latest Latin text and the comments were tossed back to the original editor to produce another text for the Advisory Committee to consider in the fall of 1968. In April, 1969, the authorized Latin text was officially published in Rome, and at last we could get down to a final translation. By early summer last year, we reached what in our jargon is called the Green Book stage. The Green Book is the committee’s semifinal—or, if you prefer the word, antepenultimate—version, issued in a green cover and sent to our own Bishops’ Committee, the various Ecclesiastical Conferences, the English-speaking bishops (all 750 of them) and to other interested parties. There were at least five texts of the Order of the Mass, all differing quite considerably before the promulgation in April, 1969. They responded with 300 pages of observations, some—but not all—most helpful. Personally I find it embarrassing when a most respected archbishop makes strong comments that are contradicted in equally strong comments by another highly respected archbishop. Either way we offend one if not both, but we get hardened to that risk. The next stage is the White Book. The Advisory Committee having considered the comments sat together in London last September and produced the penultimate version. This was discussed two days later in a common meeting with our Bishops’ Committee at the Strand Palace Hotel, of all surprising places. I found it most inspiring to sit with a cardinal and six archbishops and bishops, all stripped to their T-shirts (for it was very hot). I have had my share of committees, and I have never sat on a committee where the members showed such understanding of the problems, sympathy, common sense and relevance. It was a true taking of counsel together. The bishops suggested some changes—very few. Finally, next day we met again, tidied up the text, and the result is what is now in use—but with two exceptions, the new versions of the Our Father and the Apostles’ Creed are not allowed in the United States…. Some who have not shared in this work say emphatically that the only right way to produce a good translation is to give it to one man, for “a committee can never produce a work of art.“ As it happens, they are wrong. Experience in the work has shown that every time a text is scrutinized by the committee, it is in some ways improved. It also follows that no one can ever claim that any particular text is his own composition. And in passing, one may note that the famous King James version of the Bible was also the work of a committee. One may note that the famous King James version of the Bible was also the work of a committee. ICEL is fortunate in that none of its members is a distinguished literary person. For some reason distinguished or well-known writers just cannot translate liturgical writing. We have tried all we could find, and not one has succeeded; they have been our greatest disappointments. And when their work is criticized, they seldom reveal the virtue of humility. Nor for that matter did St. Jerome. Apart from the problems of time and place, the greatest difficulty is the Latin text. The traditions of liturgical Latin are almost, but not quite, as old as Christianity. Educated men in the second and later centuries received an elaborate training in rhetoric; and in the Imperial Court at Rome or Byzantium they addressed the sovereign with obsequious phrases and gestures. Englishmen also in the 16th century, and later, endured the same kind of education in rhetoric and flattered the sovereign in the same way. Latin liturgical conventions were thus natural in Cranmer’s Book of Common Prayer, and to those brought up on that book, its language seems the only proper respectful way of addressing God. This hyperbolical tradition is still strong in Vatican City. Even members of ICEL receive letters addressed on the envelope “To the Most Reverend, Most Learned, Professor”—to the irreverent amusement of their families. It sounds much better in Italian. ICEL is fortunate in that none of its members is a distinguished literary person. Modern masters of prayer have entirely rejected that mode, masters such as Péguy, Caryll Houselander, Quoist, Oosterhuis. They no longer compose prayers in the style of a loyal address to the King of Kings by his abject slaves. Instead they prefer the direct speech of child to Father, as our Lord taught us in the Pater Noster. The Gospels plainly show that in His prayers Christ used the simplest words. So too in his talk and his parables. “Two men went up to the Temple to pray, one a Pharisee, the other a tax collector.... The tax collector stood some distance away, not daring even to raise his eyes to heaven; but he beat his breast and said: ‘God be merciful to me a sinner.’” Seven words. The tax collector's prayer is recast in the collect for the fourth Sunday after Epiphany thus: “God, who knowest that, set as we are amid such perils, our human weakness cannot stand fast, grant us health of mind and body, so that with thy help we may overcome the afflictions that our sins have brought upon us.” One sentence of 41 words. That is the difference between the sacral style and the Gospel style. In our translations we try to be simple, comprehensible and, as far as grace inspires, dignified. Most of the severest critics of the ICEL translations fail to realize the facts of life. The texts are not for their own community or parish, but for every community. There are about 70,000,000 English-speaking Catholics throughout the world. Of these, 82 per cent live on the North American Continent, 6 per cent in England and Wales. Most English-speaking Catholics, whatever their country, are simple people with small knowledge of the Bible, Church history or English literature. A translator must never forget he is providing words for public utterance to and by plain folk. Hereupon the literate critic cries out in disgust: “What? Basic English?” The answer is: “Yes, Basic English,“ just as the Gospels were written in a kind of Basic Greek (the learned call it koiné). They were intended not for educated Greek and Roman gentlemen, but for slaves, merchants, soldiers, shopkeepers, sailors and common people; and for that very reason, because the basic instincts of ordinary folk are more durable than the tastes of professional writers and critics, the Gospel narratives are still vivid and readable. Professional critics very seldom realize that simplicity is the supreme form of art—and the most difficult. Of the scores of translators who have contributed to this work, I have encountered only one to whom the gift of true simplicity has been given. Christ made few followers among the periti, the illuminati and the literati; in his day they were called Pharisees and Scribes. Serving on the Advisory Committee has been a great experience, for one learns so much. One learns, or at least one tries to cultivate, the virtue that before Vatican II was known as “holy indifference”—to realize without peevishness that one’s own translations are not always considered to be the best. One learns to accept, or at least endure, criticism and abuse that varies. In England it takes the form that the members of the ICEL are stupid people, ignorant of Greek, Latin, theology, liturgy, Scripture and English. In this country, we are denounced as heretics, cryptocommunists and cunning, sinister conspirators in a vast plot to undermine and destroy the Catholic Church. We can’t be both. One learns to realize without peevishness that one’s own translations are not always considered to be the best. But let that pass.... One develops other sensitivities, at times a sobering sense of awe. Most Christians find God through public prayer. Commonplace prayers, tired words, meaningless pomposities, clog devotion; and there are 70,000,000 Catholics for whose faith we are in some ways directly responsible. But the responsibility is shared. The liturgy is a tremendous drama; it means little unless the principal actor has rehearsed and studied his part. We shall lose more than we have gained if English in the Mass is marred by sloppy diction and impatient gabbling. Manuals of devotion used to provide aids for the sacrament of penance, lists of sins that might have been overlooked since one's last confession: “Have you committed murder? If so, how often? You need not mention names.” There should be similar aids for the clergy, including a section on performance as a celebrant. “Have I always and carefully read over the Mass of the day before entering the sanctuary? Have I chosen the second or third Eucharistic prayer because it is shorter than the first or the fourth? Have I been fully conscious that the response of the congregation depends on how skillfully I lead them?” I mention this matter because those who are interested in the liturgy in English are acutely conscious of the way it is said. With the completion of the Mass, the rites of baptism, marriage and burial, we have now reached the first stage in the reform of the liturgy. Much still remains to be done. There are about a thousand prayers of all kinds, and ICEL is still searching, not for critics, of whom we have almost enough, but for those masters of good, simple English who are seemingly too modest to offer help. For some years to come the ICEL will still need your prayers. And the Church also. From what I have experienced, this whole concept was overthrown with the latest transliteration! Even last year Pope Francis called for again going back to the spirit of Vatican II ---- yet American bishops seem not to have heard and we are stuck with this transliteration which is not a translation in the spirit of this article! This article also appeared in print, under the headline "Englishing the New Liturgy," in the April 15, 2019 issue. G. B. Harrison, 1970 recipient of the Campion Award from America’s Catholic Book Club, was a Shakespearean scholar. After retiring from his professorship at the University of Michigan, he dedicated his skills to the International Commission on English in the Liturgy.